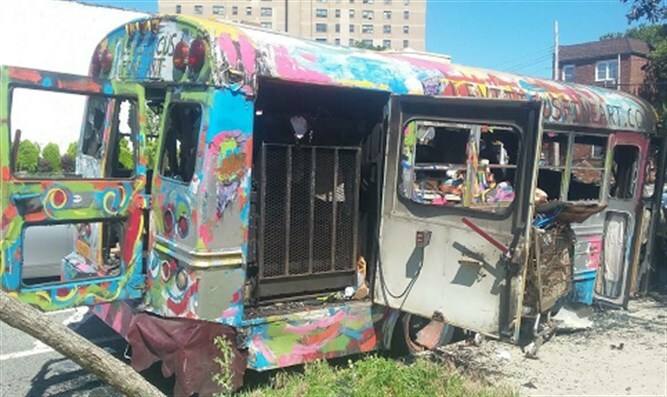 Vandals in Brooklyn burn colorful bus belonging to local Jewish artist. A minibus belonging to a Jewish artist was torched in Brooklyn by unknown vandals on Sunday, the COLlive news website reported. The brightly-painted and many-colored bus belongs to artist Lev Scheiber, a resident of Crown Heights who goes by the name "Leviticus." Scheiber uses the bus to drive his children to school, to travel, and as his art studio. The bus is adorned with bright painted illustrations, including Jewish symbols such as menorahs. It has been featured on singer Benny Friedman's music video "Ivri Anochi." "When I got to the bus in the morning, to retrieve some art supplies, I found it completely charred," Scheiber told COLlive. "It looked like the Apocalypse." Scheiber said that when he contacted the police they told him that "it didn't matter." "They told me to try and find my own surveillance footage from nearby homes, and that it was my problem," he said. Singer Benny Friedman, expressed his shock that someone would torch the bus. "The world is unfortunately full of these sad reminders that the work of filling the world with light is a full time job," Friedman said. "My friend Lev drives a 'Mitzvah mobile,' a vehicle that just from its look alone adds joy and excitement to people's day, and reminds us to spread light. Hatefulness and darkness don't have a chance," he said.